Kamchatka, is known as the Land of Fire and Ice, and rightly so. The Kamchatka Peninsula is home to approximately 160 volcanoes, of which 29 are still active, including the Shiveluch volcano, which started erupting last week. For many years, snippets of this closed off and mysterious land captured the imagination of intrepid travellers entranced by stories of smoking volcanoes, abundant wildlife and jaw dropping scenery. 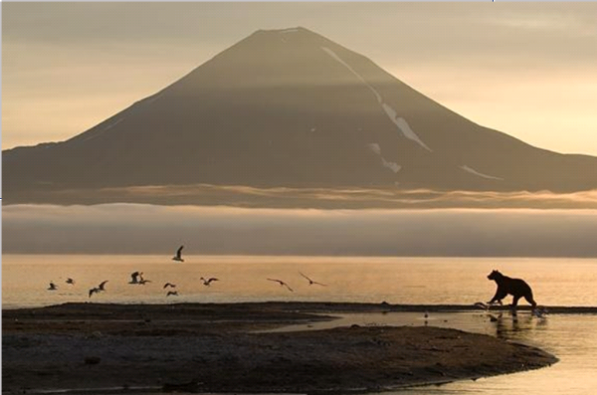 It is only in the last ten years that Kamchatka has opened up to tourists with Heritage Expeditions pioneering expedition cruising along the peninsula in 2007. Kamchatka offers much to delight the traveller and we strongly recommend incorporating a few days exploring the Kamchatka peninsula with an expedition cruise.There's never been a better time to explore a part of Russia that most people only dream of. Discovered in 1941, the UNESCO World Heritage Site of the Valley of the Geysers is one of the most unique natural wonders in the world. One of the world's largest geyser fields, it attracts numerous international visitors keen to experience this incredible attraction. Travel by helicopter from Yelizovo to the Valley of the Geysers and be wowed by views of active and extinct snow covered volcanoes, as well as steep mountain ranges, taiga, rivers and lakes. Fly past two interesting volcanoes, the very active Karymsky volcano (1486m) and Maly Semyachik (1560m) which has an acid lake in its crater. After landing in the Valley of the Geysers, explore this valley where more than 20 large geysers erupt at regular intervals from every 10-12 minutes to every 4-5 hours. Travellers are mesmerised by the fountains of boiling water, vents of steam and the incredibly vivid colours of the valley's slopes contrasting with the intense greenery of the grasses and trees. This one day experience provides the perfect complement to an exploration of the Kamchatka Peninsula such as Siberia's Forgotten Coast, which departs from Petropvalovsk- Kamchatskiy on the 24th June 2015. Contact us for a full list of available excursions in Kamchatka.